Custom built awnings provide wonderful benefits to both residential and commercial owners. These awnings are known for increasing property value, providing energy savings and protecting the sun. An excellent custom built awning to have on any home or business is the Sunlight Classic. The Sunlight Classic increases your home livability while adding beauty and value to your home. It’s a great retractable awning because it features multiple add-on options with five different projections up to 10 feet. This allows the Sunlight Classic to offer you complete sun control to make a perfect retreat in your back or front yard. If you install the sunlight classic in your front yard, it will enhance the curb appeal of your home by adding shape, dimension and color to an otherwise ordinary home. When you add drama and impact to your home exterior, it adds instant value to your home. As for energy savings, this awning can reduce your home’s interior heat during periods of direct sunlight by 77 percent, as American Society of Heating and Air Conditioning has revealed. Let Carroll Awning install your Sunlight Classic Retractable awning. To learn more details click here. Through our combined locations and experience, Carroll Awning Company provides innovative craftsmanship, superb service, competitive pricing and unfailing attention to details in order to deliver a product that exceeds expectations.A satisfied customer is always our first priority. We work with each of our customers to design an awning or canopy product that meets all the requirements of the situation. Thousands of projects and satisfied, repeat customers have taught us price is a primary concern but not the only concern. Therefore, quality and longevity of your awning are important factors in determining the true cost of the product. Material costs vary greatly and reflect the life expectancy and warrant they carry. 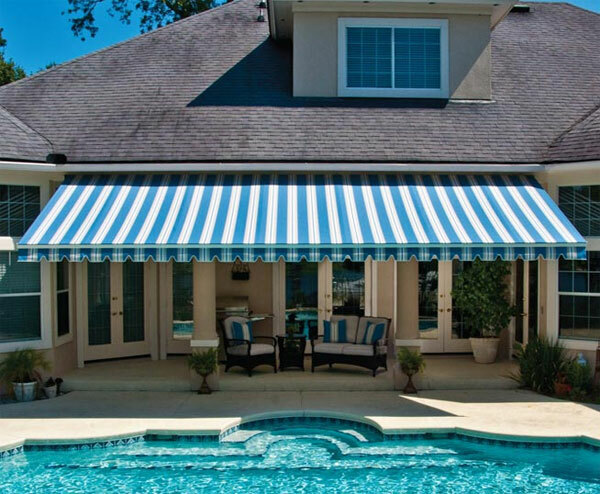 We can help you determine which products will provide the truly cost effective awning. For more information, fabric swatches and free quotation call Carroll Awning at 1-800-999-5617 or click here today! Awnings can be used to advertise a business, beautify a building or home, offer shelter from the weather or control energy costs — or all of these things at once. We custom make many different kinds of awnings for many different clients, both commercial and residential. Let Carroll Awning serve you.